Bad news, humans! The Andromeda Galaxy is barreling toward the Milky Way, the sun of our solar system will explode, will extinguish itself, as all stars do, and, long before either of these things happen, most of the Planet Earth will become uninhabitably hot. All of the planets within our galaxy, with the exception of Earth, are unlivable, which means that the human species, if it is to survive at all, will have to trickle away the rest of its existence in spacecraft. Otherwise, we are hurtling toward our extinction and oblivion as if we were a suicide of lemmings. Percy Bysshe Shelley saw all of this coming and wrote a poem about the destruction of our world, in the autumn of 1819, when the poet was twenty-seven, entitled “Ode to the West Wind.” It recalls an earlier poem by Albrecht von Haller entitled “Incomplete Poem on Eternity” (1736), which was quoted by Immanuel Kant in his youthful essay “Observations on the Feeling of the Beautiful and of the Sublime” (1764). (It is not entirely certain whether Shelley read Kant, much less Haller. See Hugh Roberts’ article “Shelley among the Post-Kantians.”) Both poems—that of Shelley and that of Haller—are chillingly apocalyptic and yet also celebratory of the apocalypse, the coming of what Haller described as “the second nothingness” that will “bury” us all. Destroyer and preserver; hear, oh, hear! The West Wind is like an invisible exorcist that expels leaves in the way that an exorcist expels ghosts. Thus far, the poem seems to be nothing more than the description of a natural phenomenon that uses a supernatural simile: A natural phenomenon (the West Wind) is likened to a supernatural force (the enchanter) that drives away another supernatural force (ghosts). Until we read of the “pestilence-stricken multitudes” who are escorted to their mass-death. “Multitudes” evokes human beings, not leaves—sick human beings, poor human beings. When the Napoleonic Wars ended in 1815, England was horribly impoverished. It was a time of famine, grave poverty, and deep unemployment. Thanks to the Corn Laws of 1815, the import of corn was blocked, and the multitudes were starving. At this point, one of the meanings generated by the poem is clear: This is an ode that welcomes the death of humanity (as it was in the early nineteenth century) and the birth of a new humanity. The poem suggests that the Apocalypse might not be such a bad idea, after all. It is not a misanthropic poem, however, since Shelley is not opposed to humanity as such; indeed, he (the paper Shelley) affirms the advent of a better humanity. I hesitate to use the word nihilistic, since the poem is not absent of value. Value-building is all that the poem does. There is a value presented in the poem, and it is the value of preservative destruction: The westerly wind is named a “Wild Spirit,” at the close of the first section, and both a “destroyer” and a “preserver.” It is the unseen presence that destroys the immiserated multitudes and the regal chariot that bears the seeds of a new humanity to their wintry sleep, to be awakened by the Spring Wind. The West Wind, then, has two functions: to destroy lost contemporary humanity and to plant the seeds for a stronger future humanity. Black rain, and fire, and hail will burst: oh, hear! The focus of the poem shifts from the ground to the sky. To be precise: The view of the poem moves from the leaves that are being dispersed, like rioters in a mob, to the clouds that are being dispelled by the aerial force of the West Wind. No longer does the poem look down upon the poverty-stricken multitudes; now, the poem looks up at the Castlereaghs and the Eldons. No love is shown for the upper classes, which are likened to a bacchante’s tresses. It is important to place the poem in the age in which it was written. Shelley had already condemned the government of Lord Liverpool for butchering the British people at Peterloo, Manchester (16 August 1819), in a rage-incented and rage-incenting poem entitled “The Masque of Anarchy.” Shelley was no nihilistic, ennui-drowsy elitist wishing for the death of the poor and uneducated masses. The paper Shelley, at least, wishes for the West Wind to sweep away everyone and everything that currently exists, both low and high. And tremble and despoil themselves: oh, hear! The tyrannies of the world—the violently repressive British government among them—are overthrown by the annihilating gust. The great wind dreamed, and this is what it dreamed: The wind envisioned the “old palaces and towers” reflected in the waters of the Mediterranean Sea. And these “old palaces and towers” were “all overgrown with azure moss and flowers.” Swathes of invasive vegetation colonize the city, which is transmuting into a jungle—an ever-growing, ever-flourishing, ever-blossoming jungle. Oh, lift me as a wave, a leaf, a cloud! The prophet, far from exempting himself from the wind’s sweepings, calls to the wind to carry him along as if he were a leaf, a cloud, or a wave. At first, it seems as if the prophet were calling for his own self-negation, but then notice how he quickly calls himself a “comrade” of the wind in Stanza Three and then identifies himself with the wind in the second line of the couplet: “[o]ne too like thee: tameless, and swift, and proud.” One cannot escape the impression that the prophet sees himself as something more than a leaf, a cloud, or a wave. If anything, this is self-deification, the raising of the Self to the godhood. This is anthropotheism, similar to the anthropotheism that Feuerbach saw in Christianity: Christians attribute the best parts of themselves to God. Translation: Let my leaves emerge from the nothingness that the wind will leave in its wake. Le me be revivified after the wind’s many destructions and annihilations. Let my poems revitalize the dead Earth. 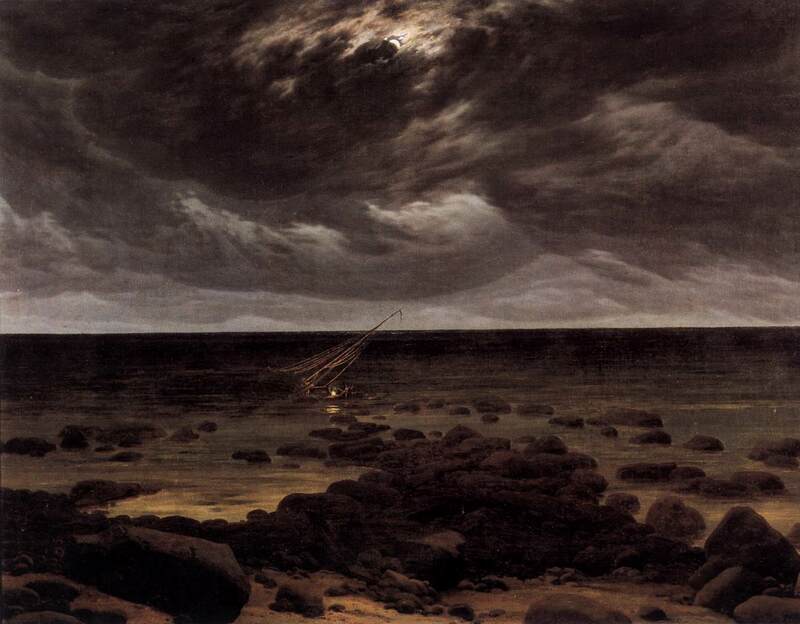 Like any good Romantic figure, Shelley’s prophet desires to unify himself with nature, but this does not mean that he would be swallowed up by nature — it means, rather, that he would swallow nature, engulf nature, interiorize nature, transform nature into the Self: “Be thou me.” This is, again, not self-obliteration; it is anthropotheism, the aggressive self-assertion of the human will. The poet’s song will outlast the wind. Concluding Unscientific Postscript. German Romanticism (of the Jena period) is nostalgic for the reunification of subject and object, self and world. English Romanticism seems to want the same thing, except, in the English Romantic imagination, the Self dominates Nature. It wants Nature to capitulate to the Self. Of me and of my soul, as I of them?